Kitchen storage is always at a premium if you live in a small apartment. It can be difficult to find space for preparing and cooking food, let alone storing utensils, pots & pans, and appliances. But no matter how small your kitchen might seem, these DIY hacks demonstrate there are lots of creative kitchen storage solutions to eke out more space . Mason jars are versatile kitchen containers for storing utensils and this organizer is easy to make. Simply find a piece of wood, sand and stain it. Drill hose clamps into the wood at intervals, attach the mason jars and hang it up. Different sized jars can be used for different sized utensils. A great way to free up precious drawer space! OK, if you simply can’t bear to part with your collection of spatulas, then a clever storage option is to turn an unused drawer into a upright utensil organizer. Get the full tutorial here. 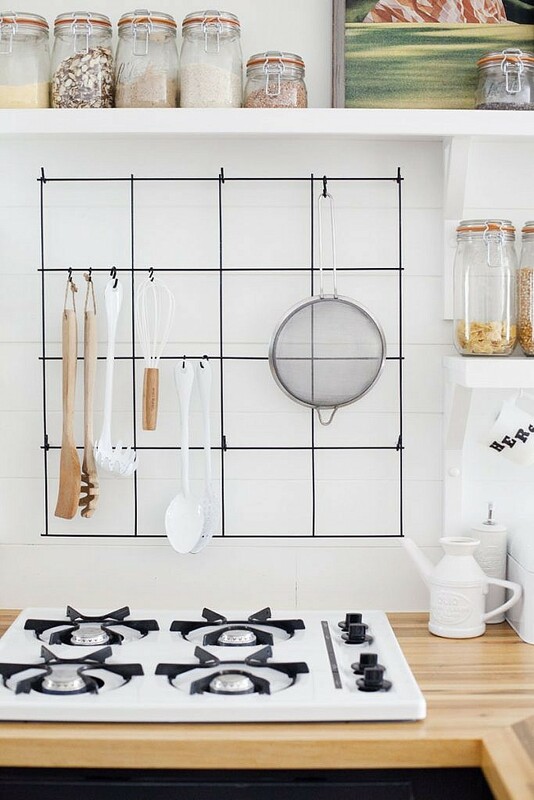 A wire kitchen rack is a space-saving storage solution that lets you hang all your utensils and free up kitchen counter space. Most utensils are designed to be hung, and might even have a hole or a loop for this purpose. Follow these instructions and install this kitchen rack behind your stove. Making use of your wall space is a smart move in a small kitchen. 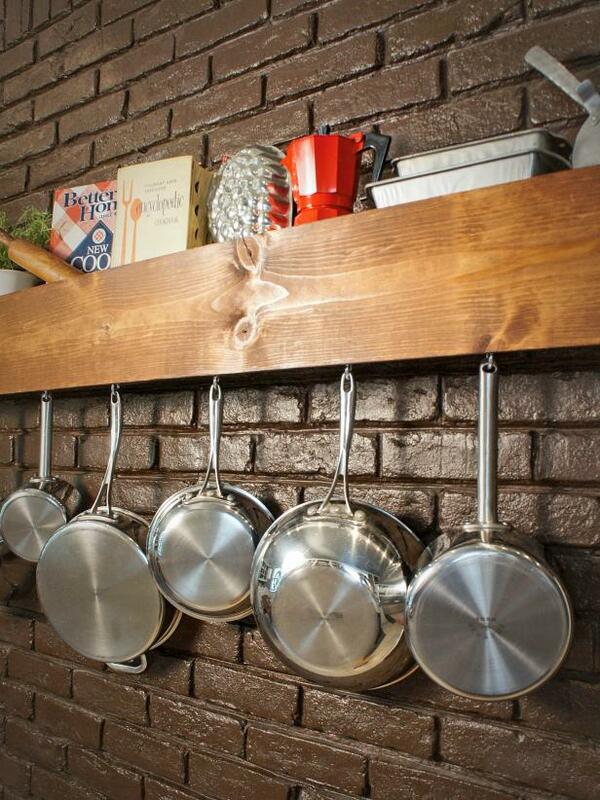 This nifty shelf is designed to hang pots & pans on the bottom, but can also store other kitchen items on the top, such as recipes books, a small coffee maker or cooking tins. 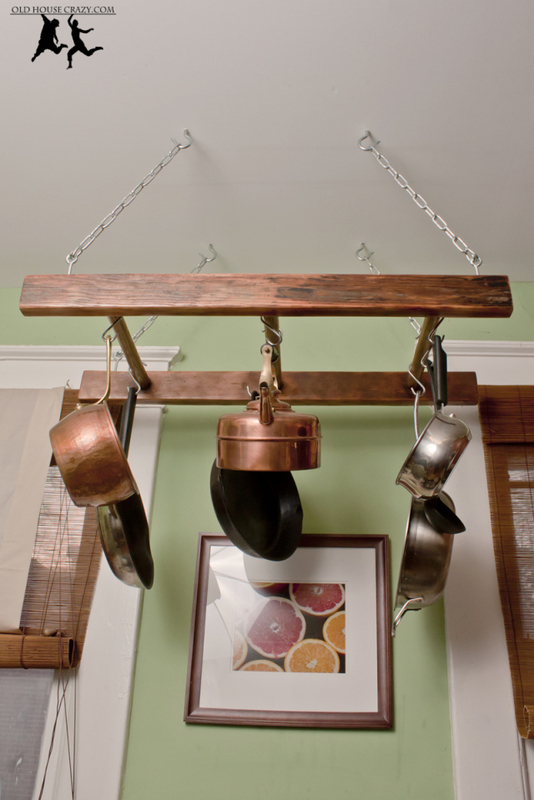 An old ladder can be transformed into a cheap kitchen organizer for pots and pans, with a little sawing, mounting, and a chain. Find out how to make your own DIY ladder pot rack to keep your pots and pans from cluttering up your kitchen. If your kitchen is small, your fridge and freezer probably are, too. Plastic magazine holders can be inserted into your freezer space as makeshift shelves to organize and store bags of frozen fruit and veggies. 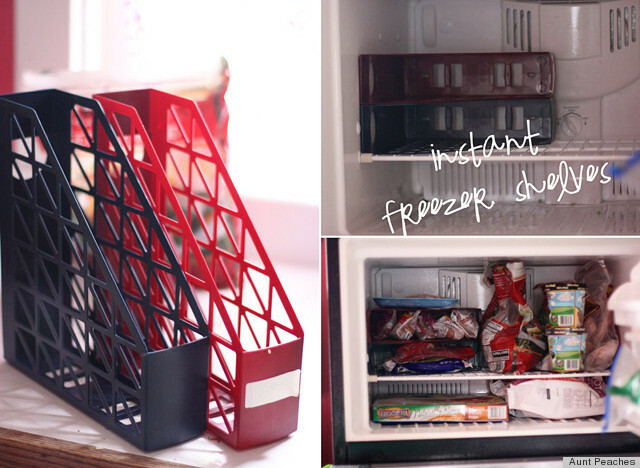 Check out how this cheap and instant hack can free up space in your freezer. Think office supplies are just for the office? Think again. 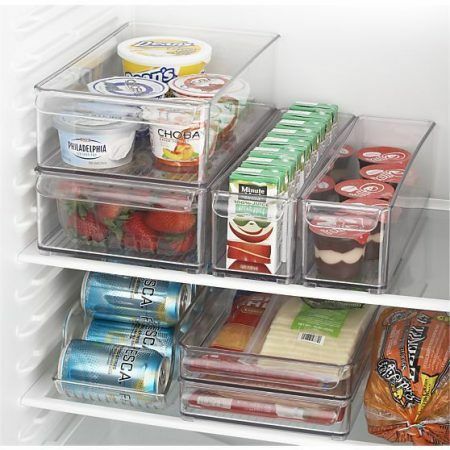 A great way to keep your fridge neat and tidy is to use clear desk organizers. These are totally stackable and let you easily see what’s what. Like wall space, you can also use the side of your fridge as space for storage. 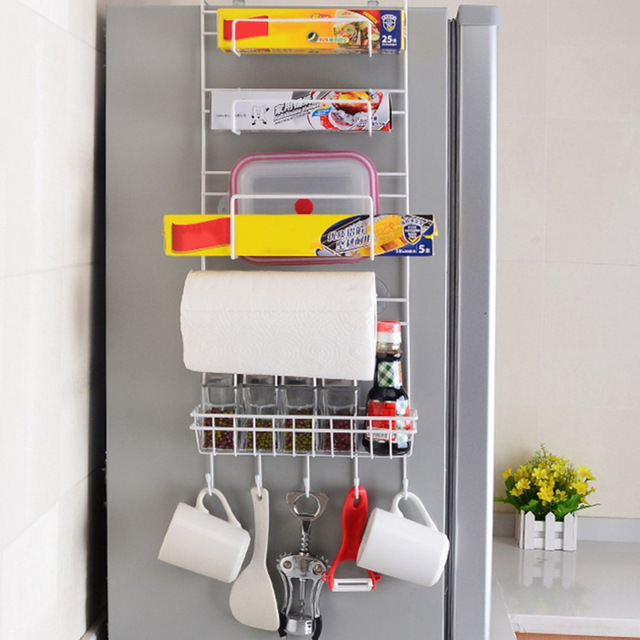 It’s a perfect place to hang a multifunctional storage kitchen rack to store items if your kitchen is lacking pantry storage. 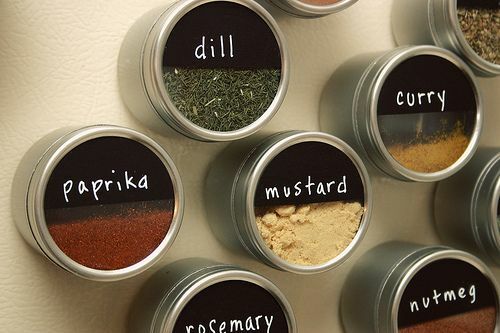 A fancy way to display your spices is to transfer them to magnetic spice tins and place them on the side of your fridge for easy access. To make sure you know what’s in them, label the tins on their backside. 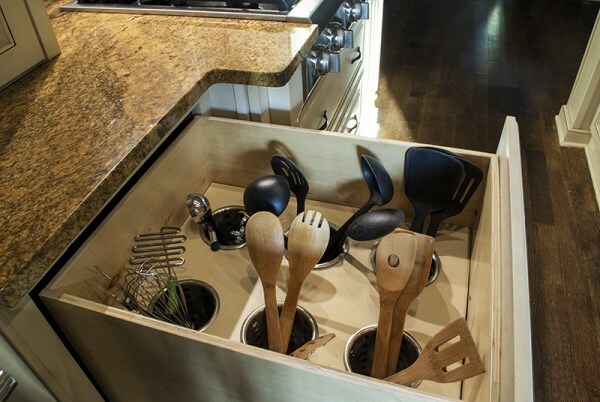 Rather than storing potatoes, squash, and beets in bags that can quickly take up space, convert the space under your sink into a cabinet. Add sliding wicker basket drawers and you have ideal kitchen cupboard storage for vegetables that need to be kept in temperate dark places. Big fruit bowls take up much needed bench space in a small kitchen. 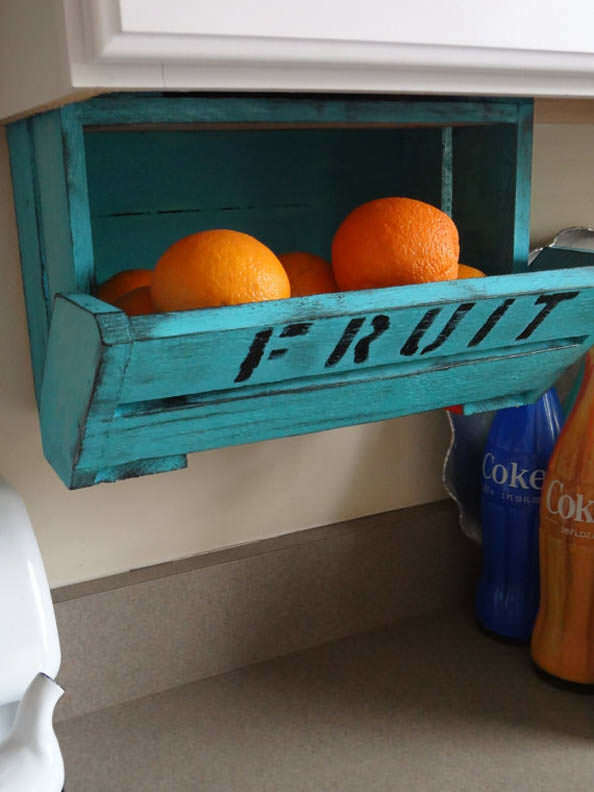 Instead, an under-cabinet fruit box is a much better idea. Who knows, if the fruit is more accessible you might be more inclined to eat it?! 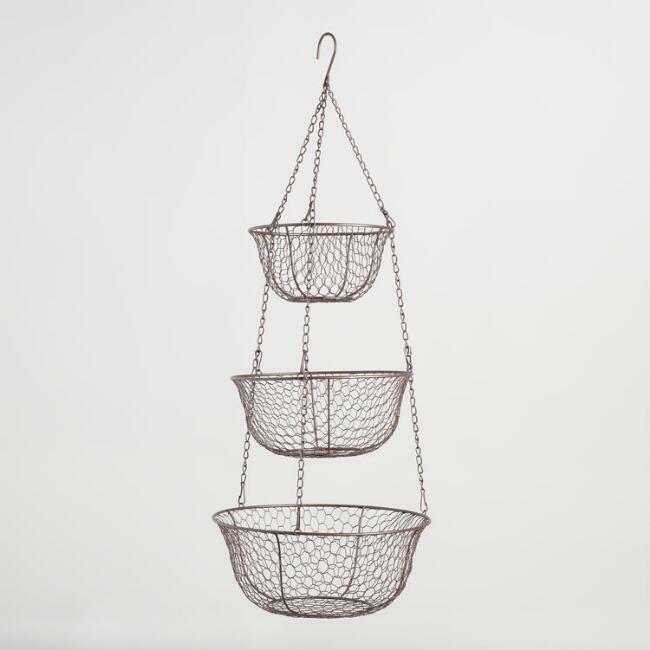 Utilize the ceiling in your small kitchen by hanging a three-tiered wire basket in one corner. 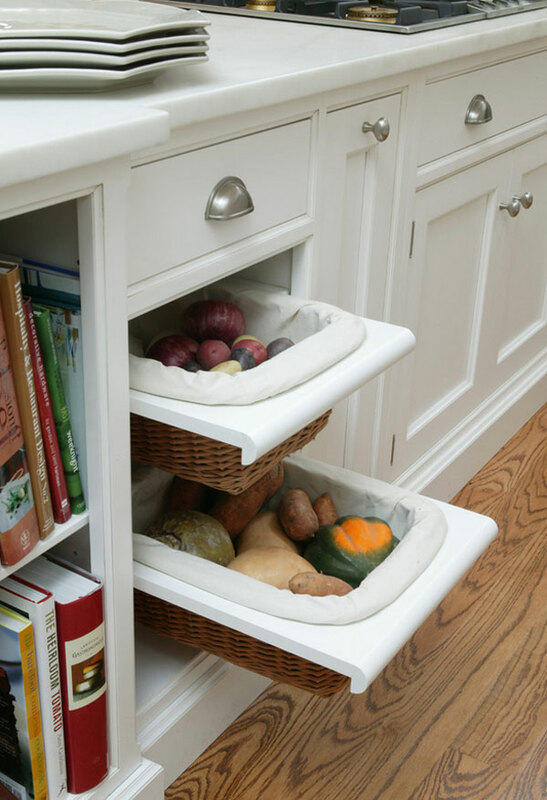 This is a great cost-effective storage option and the baskets are different sizes. A small one on top for holding garlic and onions, a medium sized one for bananas, avocados, and oranges and a bigger one on the bottom for bread and other large items. Organize your kitchen cleaning products by inserting a Lazy Susan under your sink. This easy under-the-sink kitchen cupboard storage idea is great for keeping the space tidy, and when you need something, just give it a spin. Spray bottles galore under your sink? Mount a tension rod underneath and suspend bottles by their spray triggers for quick and easy access to cleaning products. This leaves plenty of space for small kitchen storage baskets containing cloths, sponges or any other cleaning products underneath.